You’re probably wondering how something as boring as a salad could be interesting, right? Well, you must not be from Malaysia, because in Malaysia, we like putting a weird twist on everything! 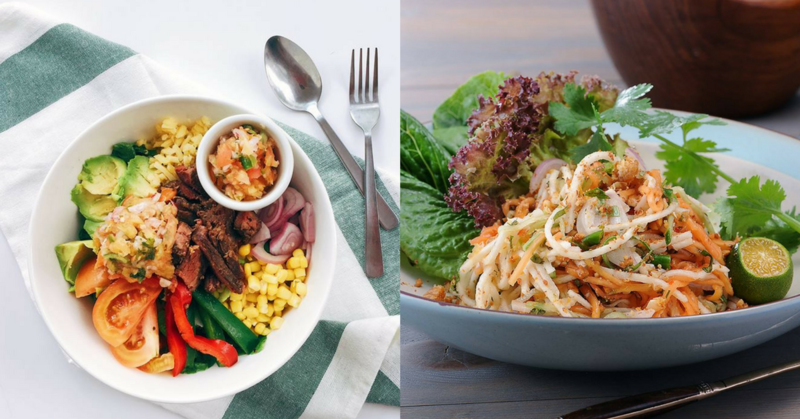 Check out these salads that are not only delicious but also unique – whether taking a traditional salad and giving a twist, or creating a whole new type of salad dish! You should also try out their other epic salads! And if you’re up for some desserts, you should try out theirs! Velocity lives in Ampang, mostly a bike workkshop and showroom, but also a café. Served with some epic chicken breasts, eggs and vegetable, the seasoning on this sald is what makes it special. And you can bet, since the café targets cyclists, that their food would be healthy as hell. This fowl salad serves a ton of duck meat, toasted almond flakes and sun-dried tomatoes, beautifully dressed to impress KL’s leaf-lovers. ANTE lies in Solaris Dutamas and serves other epic dishes that will definitely heighten your taste buds. Also can we talk about their pork dishes (which is their specialty)? Sinfully delightful, salade gourmande is typically a French salad. This one has a myriad of components that includes smoked duck breast, artichoke, gizzards, goat cheese, sundried tomatoes and epic croutons, all drizzled with some delicious French dressing. Yes please! Deliciously creamy, which is the theme for this salad, its ingredients includes generous amounts of avocado slices, a runny mollet egg, artichokes, marinated salmon gravlax, mesclun, chives and of course, parmesan. If you’re looking for some creamy comfort salads, head here! And I’m going to pretend that this is probably healthy because there’s some green in there, and as we’ve learned from this entire list, salads don’t have to be all green. Pronounced as “Ni-sua” rather than “Ni-kois” (lol), this old-skool salad substitutes tuna with blue swimmer crab meat along with some tomatoes, corn, new potatoes, half-boiled eggs, French beans, baby romaine, onions and boiled eggs, dressed in some sesame dressing. And if you’re in the mood for a more adventurous salad, give their Panko Crumbed Soft Boiled Eggs and Smoked Salmon Salad. Because. Look at that. Now most people see salad has an appetizer, but Wondermama likes to go one step ahead and make it a whole meal (which I don’t think I can even finish). Wondermama’s signature salad comprises of cubed potatoes, fried chicken, tomatoes, and veggies – there has to be some greens in this dish, or you can’t really call it a salad, can you? If you’re looking for a healthy meal which can also fill you up, this is the place to go. If you want something a lil’ spicy, try out their Thai Smoked Duck Salad too! Me right now, just by looking at the pictures. Who else wants to get healthy now? !